ON Semiconductor lets us know that the fake ATmega328s are actually NCP5318 buck regulators for Intel processors. ON Semiconductor emailed us and helped us identify our mystery ICs. 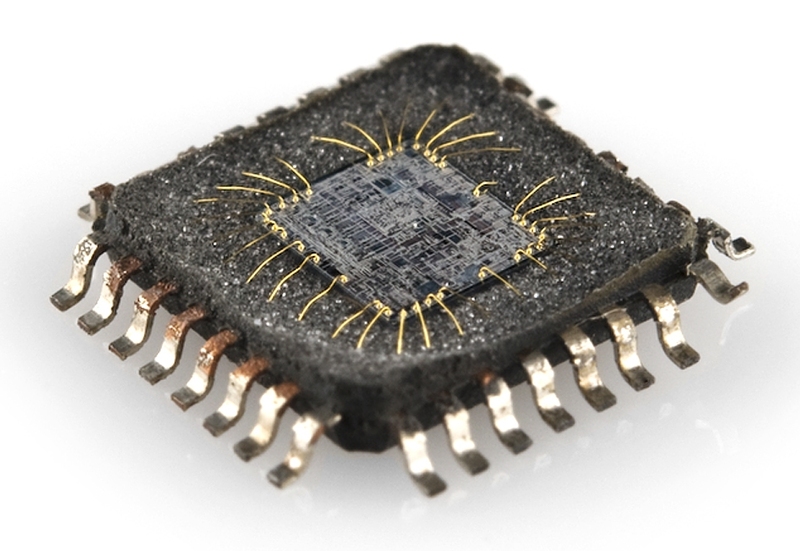 It turns out the semiconductor IC inside our fake ATmega328s is the ON Semi NCP5318FTR2. 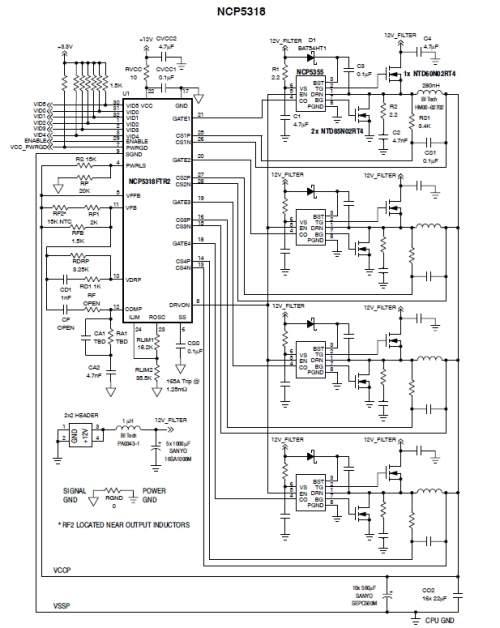 The NCP5318 is a Two/Three/Four-Phase Buck CPU controller. Essentially it's a voltage regulator specifically designed to power high-performance Intel processors. This application circuit is a bit daunting. We may try to wire one up, but in general, a complex buck controller is not something that really floats our boat. "Interesting. The AG20 is called the "Hydra lite." The hydra was originally an 8 phase Vcore buck switcher for CPU/GPU. Hydra lite was reduced to 4 phase. They were built on 18 volt bipolar process. The final version was rev 13, so it looks like that die in the picture is pre-release engineering material. Where the hell did you find that?" Ponoko has the lasers, We've got the guts, You could win the glory! I hope ON Semi is working with you to find the leak in their supply chain. What do you mean by "Thanks ON Semi" ? is it "Thanks for letting others re-label and sell YOUR chips"? Is it the end or will you try to catch those guys who sell fake ICs? To Catch a Predator : BLACK MARKET EDITION!!! Seems to be a common enough problem that there is a yearly "Symposium on Counterfeit Electronic Parts" held at the University of Maryland every year. Wow! Wish I lived somewhere close to a semiconductor manufacturer. Really cool what you have done to figure out what it is, instead of an Atmega. 2)Catching the criminals that sold these chips to the one that sold them to the one that sold them to the one that sold them to you. Correct me if im worng but this is a voltage regulator. Well then try to wire one up and use it for that purpose that would make a great tutorial or project on how to use chips based off of what you can learn from their datasheets. It was amazing ha ?!! As far as I can say shopping in Asian online shops like running in a field filled with land mines . I wish to know what was the process used to remove the IC package in a very clean way as shown in the photo? Soooo nice reverse engineering step; Can anyone tell me about it? By the way I used this photo as desktop background. Its still a part, not a system or even a product. Motherboards use many component types already sold on this site. i really want to hear about there reaction when you tell them how you got them. The pursuit of pure knowledge and technology is often not subject to a simple cost/benefit analysis. Obviously it was a huge effort, but I'm sure that much was learned in the process. And I really appreciate SFE for letting us all in on the details of this adventure! I can see selling these as novelties, but PLEASE mark them a such (maybe use a rubber stamp on the bottom of the chip?) in order to avoid being accused of being a seller of counterfeit goods. I second that. Thanks for providing a wonderful mystery story. Speaking of selling them...you could encase each one in plastic with the Sparkfun logos and the legend "No Phony Chips". They'd make great key fobs. I'd buy several, that's for sure. I second the chips-in-plastic idea! Pre-release engineering material? If I understand the term correctly that chip never hit the market? So if I'm correct them someone sold the production die to some manufacturing plant thinking that they were duplicating the AtMega? Did they cheaters got scammed? I parse "pre-release engineering material" as "small quantity runs of our then-new device to test it for bugs. We found a lot of them -- enough that we'd need 6 more revisions to get something good enough to sell -- so this particular chip probably won't actually work for you, even if you do need a 4 phase Vcore buck switcher for an Intel CPU/GPU." Even if just used as part of a tie clip, this would make for an interesting conversation piece. A bit of SF's History. Didn't think about that. Will you guys be selling these again since we now know what they are? You going to be selling them now you know what they are? Haha, love that comment from the guy at ON Semi. I'd love to see you guys wire one up, but what the hell would you do with a high-performance Intel processor? And a red breakout board. 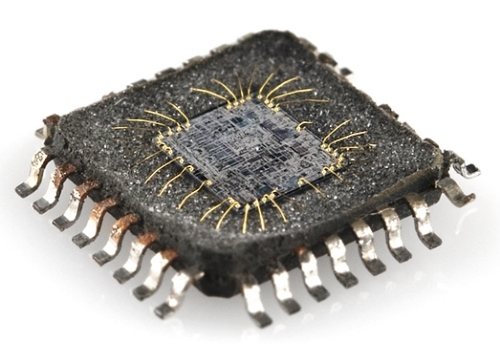 Just an interesting thought, are they all the ICs actually the same because I was reading about how Chinese workers (read slaves) remove all sorts of electronic components from old computer and other boards for reuse etc. Could this be a case of a whole bunch of this particular package ICs being re branded and sold off? We tested three of the parts from different spots on the reel. We're pretty sure they're all the same, but there's no telling really. Where the hell did we get those? That is a great question.